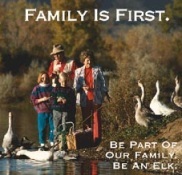 Each State Elks Association has its own charitable project. These include summer camps for children with disabilities or who are financially disadvantaged; in-home treatment for people with disabilities; children's hospitals; cancer research; and providing safe, temporary havens for abused families. In nearly 2,200 communities, men and women of our local Lodges are working to meet local needs, whether that's funding the food bank, supplying instruments for the high school band, holding a drug-free prom, or promoting literacy at schools and libraries. We believe in helping others, but we also believe in having fun. Often we manage to combine the two. Some of our Lodges feature swimming pools, golf courses, playrooms, and ballrooms; most have dining facilities; all offer family entertainment. We enjoy doing the good works we do and the people we do them with - our families and our friends.